This four panel exterior door has a large lite (a panel with a pane of glass) in the top half. As the glass is clear, the homeowners have hung a lace curtain for a bit of privacy. This adds to the overall quaint look to the home. The door has a horizontal panel at its mid rail. The bottom two panels are of equal size and stand on their short sides next to each other above the bottom rail. 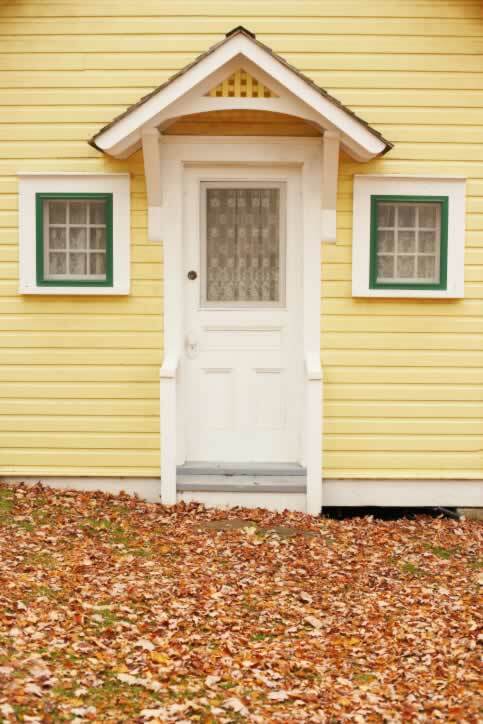 The wood siding is painted yellow and the stoop is covered. The pitch of the stoop's covering and the detailing--trellis painted yellow to match the home and white trim--adds to the story-book feel. To each side of the door are square casement windows. Each of these are mullioned windows--windows with pieces of wood dividing the glass up into parts. The windows have been trimmed with two colors. A dark green trim is surrounded by broader white trim.